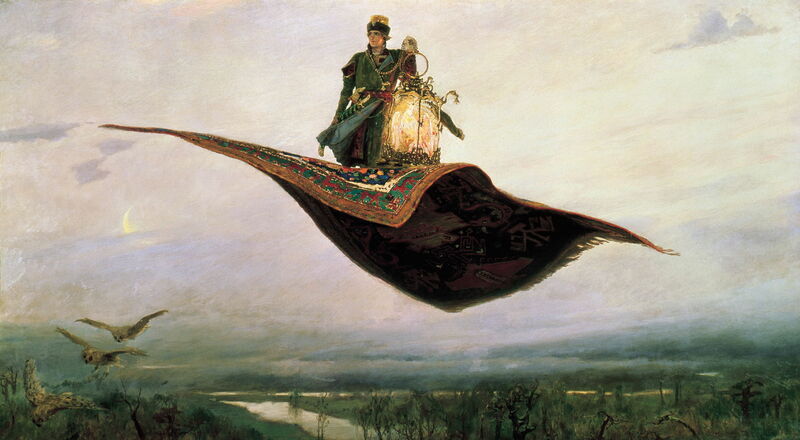 Viktor Mikhailovich Vasnetsov (Михайлович Васнецов) (1848–1926), The Flying Carpet (1880), oil on canvas, 165 x 297 cm, Nizhny Novgorod State Art Museum Нижегородский государственный художественный музей, Nizhny Novgorod, Russia. Wikimedia Commons. Having seen how popular paintings of the modern ‘legend’ of Quasimodo and Esmeralda became during the nineteenth century, this article looks briefly at paintings of other well-known folk tales from around the world. 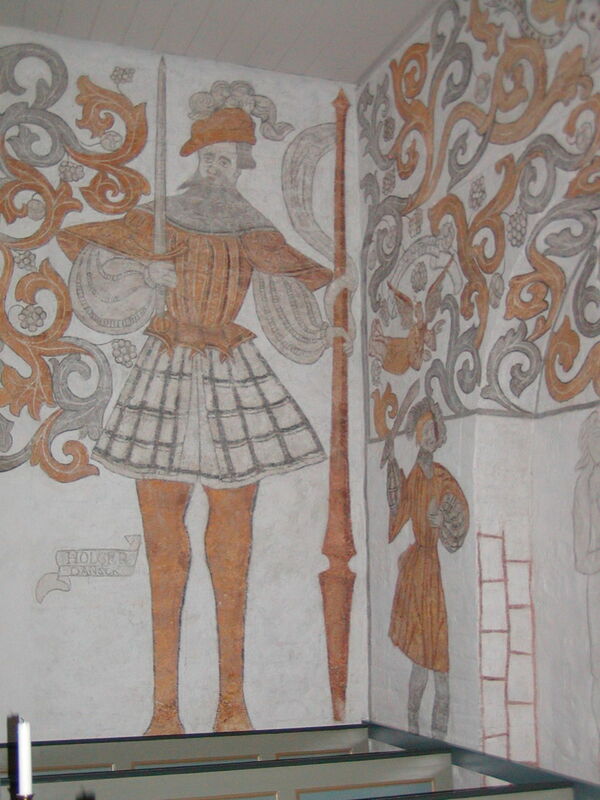 Artist not known, Holger Danske (Ogier the Dane) (c 1550), wall painting, dimensions not known, Skævinge Kirke, Skævinge, Denmark. Image by Saddhiyama, via Wikimedia Commons. Holger Danske, more generally known as Ogier the Dane, is a legendary character believed to have been based on a Frankish knight who submitted to Charlemagne, who is celebrated in old French tales from around 1220. He also appears in his Danish guise as the son of King Gøtrek of Denmark, according to a Danish account of 1534. Not long after that, an unknown vernacular artist made this wall painting in the church at Skævinge in Denmark. Stories of Sinbad the sailor seem to have originated in the Middle East during the late first millenium, and are set in the reign of the Abbasid Caliph Harun al-Rashid around 800 CE. They first came to the west as late additions to the compilation known widely as the Thousand and One Nights, where they appeared in around 1650. Elihu Vedder’s The Roc’s Egg (1868) shows a scene from the second voyage of Sinbad, when he is accidentally abandoned on an island on which there are roc eggs. Rocs are enormous legendary birds which appear in various ancient sources. Here the sailors remove the contents of one of the roc’s giant eggs, which they cook on an open fire. Later in that adventure Sinbad uses a roc to obtain diamonds, before returning home to Baghdad. Another rich source of folk tales and legends are those of the Slavs in eastern Europe. The Polish bishop and chronicler Wincenty Kadłubek recorded the legend of Wanda in the early 1200s. Maksymilian Piotrowski (1813-1875), The Death of Wanda (1859), oil on canvas, 272 x 200 cm, Muzeum Narodowe w Krakowie, Kraków, Poland. Wikimedia Commons. Wanda was the daughter of the legendary Polish king Krakus, who founded the city of Kraków. After the king’s death, her lands were invaded by a German tyrant. When Wanda led her forces out in battle, the Germans saw her beauty, refused to fight, and their commander killed himself. 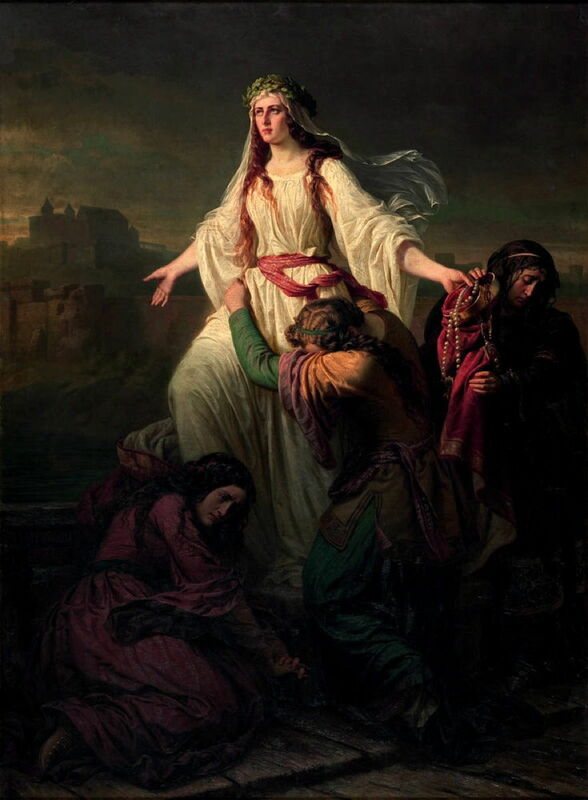 In later accounts, Wanda’s army overcame the invaders, but she later committed suicide by throwing herself into the Vistula river, as shown in Maksymilian Piotrowski’s dramatic painting of The Death of Wanda from 1859. Jacek Malczewski (1854–1929), Załaskotany (Tricked, Rusałki Cycle) (1888), oil on canvas, 38 x 109.5 cm, Muzeum Uniwersytetu Jagiellońskiego w Krakowie, Krakow, Poland. Wikimedia Commons. A more modern Polish artist Jacek Malczewski painted the Rusałki Cycle telling stories about the rusalki, water nymphs drawn from central European legend. In Załaskotany (1888), he shows a whole group of rusalki laughing at the way that they tricked the boy in the centre foreground, who appears to have drowned as a result of their malicious prank. Russia has a long and rich tradition of fairy and folk tales and legends, among which the story of Ivan Tsarevich, the Firebird and the Grey Wolf is perhaps the best-known. This was first collected by the pioneer ethnographer Alexander Afanasyev in the middle of the nineteenth century. Each night, one of the golden apples on the king’s tree was stolen, reportedly by the Firebird. The king offered his two oldest sons half his kingdom if one of them caught it, but both fell asleep. The youngest son, Ivan Tsarevich, asked if he could try, and managed to capture one of its feathers. This made the king want the bird even more. The older brothers set out in pursuit of the Firebird, but confronted with a crossroads they didn’t know which of the arduous roads to choose, so gave up and became idle. Ivan begged to go, and chose the second road, which a nearby stone promised would let him live but his horse would die. Sure enough, as he pressed on down the road, a large grey wolf killed and ate his horse. Ivan carried on walking with the wolf, which eventually offered to carry him. The wolf brought Ivan to a garden, where the Firebird was kept in a golden cage. The wolf told him to capture the Firebird without touching the cage. When Ivan tried to take the cage as well, bells rang and he was captured. He was told that he could have the Firebird only if he brought back the Horse with the Golden Mane. The Grey Wolf carried Ivan to the stables where that horse was kept, but warned him not to touch its golden bridle. Once again, Ivan gave way to temptation and touched the bridle, causing alarms to ring and his capture. Now his challenge was to bring Helen the Beautiful back to be the wife of the second king, who kept the horse with the Golden Mane. The Grey Wolf carried Ivan to the castle where Helen the Beautiful lived, and carried her away with Ivan. Viktor Mikhailovich Vasnetsov (Михайлович Васнецов) (1848–1926), Ivan Tsarevich on the Grey Wolf (1889), oil on canvas, 249 x 187 cm, Tretyakov Gallery Государственная Третьяковская галерея, Moscow, Russia. Wikimedia Commons. 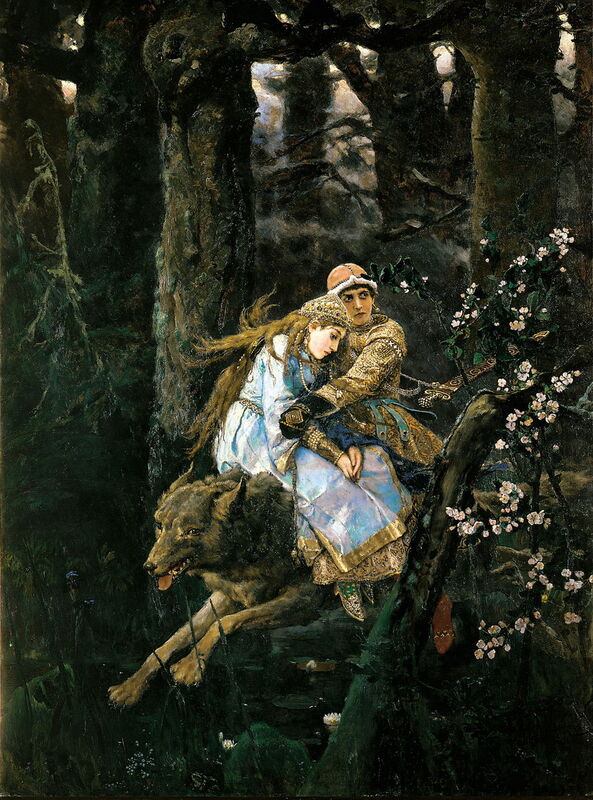 Viktor Mikhailovich Vasnetsov’s painting of 1889 shows Ivan Tsarevich on the Grey Wolf. By the time that Ivan had reached the stables, he and Helen had fallen in love, so the Grey Wolf turned into a princess, who Ivan exchanged for the Horse with the Golden Mane. Ivan and Helen rode that horse back towards the Firebird. During that journey, the Grey Wolf rejoined them, having escaped from the king with the stables. Ivan asked the Grey Wolf to change into a horse with a Golden Mane so that he could exchange it for the Firebird. This allowed Ivan, Helen, the Firebird, and the horse with the Golden Mane to set off back to Ivan’s father. When they reached the point at which the Grey Wolf had eaten Ivan’s first horse, the wolf left them. Vasnetsov’s first painting of the tale of Ivan Tsarevich shows him riding on a Flying Carpet (1880), together with the Firebird in its golden cage. This was commissioned by the rich industrialist Vasnetsova Savva Ivanovich Mamontov, and influenced by stories of flying carpets from the Thousand and One Nights. In the original account, Ivan’s older brothers found him, killed him, and sliced his body up into small pieces. They told Helen that they’d kill her if she didn’t tell their father that they had won the horse, Firebird, and herself. The oldest son was then given Helen in marriage, and the other son received half the kingdom. The Grey Wolf found Ivan’s remains, and through some crows restored Ivan’s body with the water of death, and revived him with the water of life. The Grey Wolf carried Ivan to Helen’s wedding, which they were able to stop, letting Ivan marry Helen and live happily after. The Swiss legendary figure of Wilhelm, or William, Tell has also attained much wider fame. It is set in around 1307, and was first recorded in the 1470s. Tell was a superb marksman with his crossbow who assassinated the tyrannical reeve Albrecht Gessler in Altdorf. This act sparked a rebellion against the foreign rulers of Switzerland of the day, and brought about the Swiss Confederacy. This makes Tell a founding father of the Swiss nation. 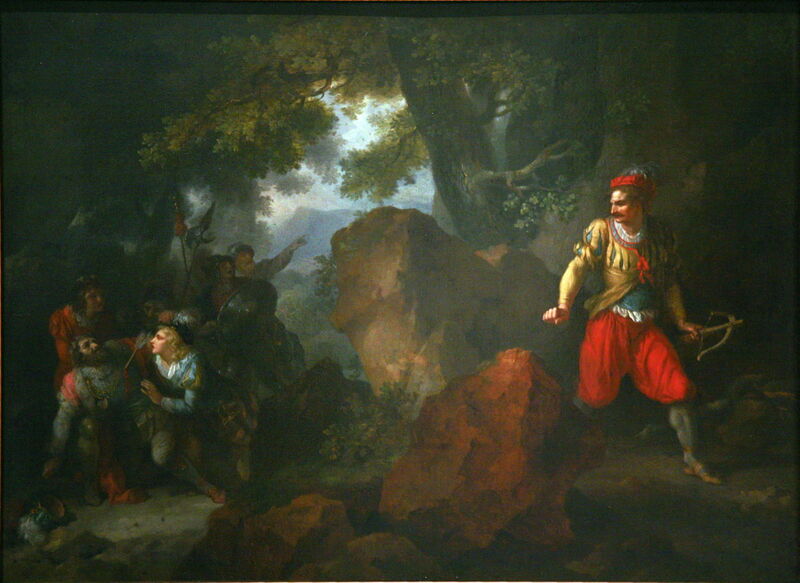 Jean-Frédéric Schall (1752-1825), The Heroism of Wilhelm Tell (1793), oil on wood, dimensions and location not known. Image by Rama, via Wikimedia Commons. Jean-Frédéric Schall’s The Heroism of Wilhelm Tell from 1793 shows Tell at the right with his crossbow, its bolt buried deep in the chest of Gessler, who is dying at the left. Lovis Corinth (1858–1925), Tell Rescues Baumgarten from the Governor’s Officers (1923), colour lithograph, 23.5 x 18.5 cm, location not known. Wikimedia Commons. Inevitably, over the period after about 1500, in its retelling, the story became extensively elaborated. 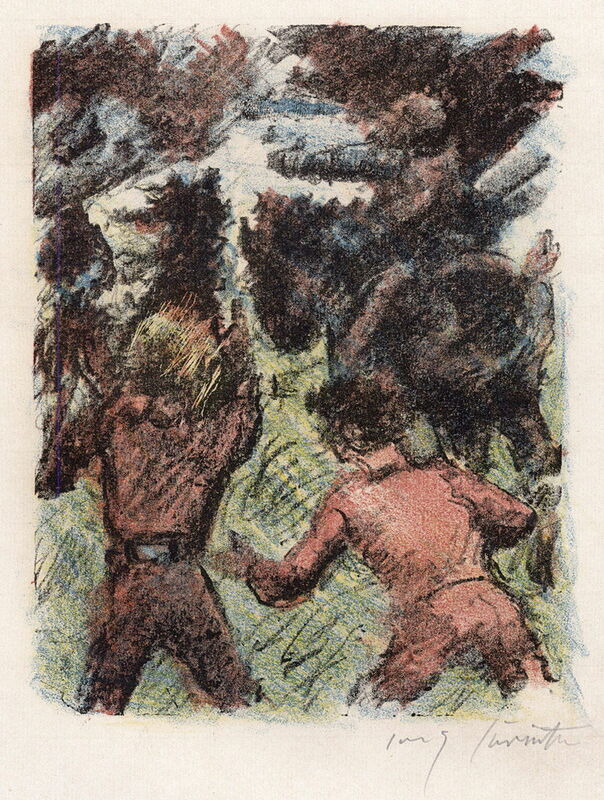 Lovis Corinth’s colour lithograph of Tell Rescues Baumgarten from the Governor’s Officers (1923) shows an episode from Friedrich Schiller’s play William Tell (1804) involving the oath-taker at the Rütli Oath of 1 August 1291 which formed the Swiss Confederacy. The local Habsburg sheriff entered Baumgarten’s property and made advances towards his wife Itta, resulting in Baumgarten defending his wife with an axe, with which he killed the sheriff. The sheriff’s men then pursued Baumgarten, who with Tell’s assistance fled to the other side of Lake Lucerne, beyond their jurisdiction. The story of the Frog Prince, which appears in many variants, is usually considered to be a fairy tale, and is the first story in the major collection published by the Brothers Grimm. Its origins are much older, though, and it is now thought to date back to a folk story or legend first cited in classical Roman times. The version recorded by the Grimms has a spoiled princess drop a golden ball into a pond. This elicits the appearance of a frog, who holds the ball in his mouth. The princess reluctantly makes friends with the frog, who is eventually transformed into a handsome prince when the spell binding him in the form of a frog is broken. Recent retelling of this story often makes the princess’s kiss the event which breaks the spell, although in the Grimms’ version the princess throws the frog against a wall in disgust at him. Marianne Stokes (1855–1927) The Frog Prince (c 1890), other details not known. Wikimedia Commons. 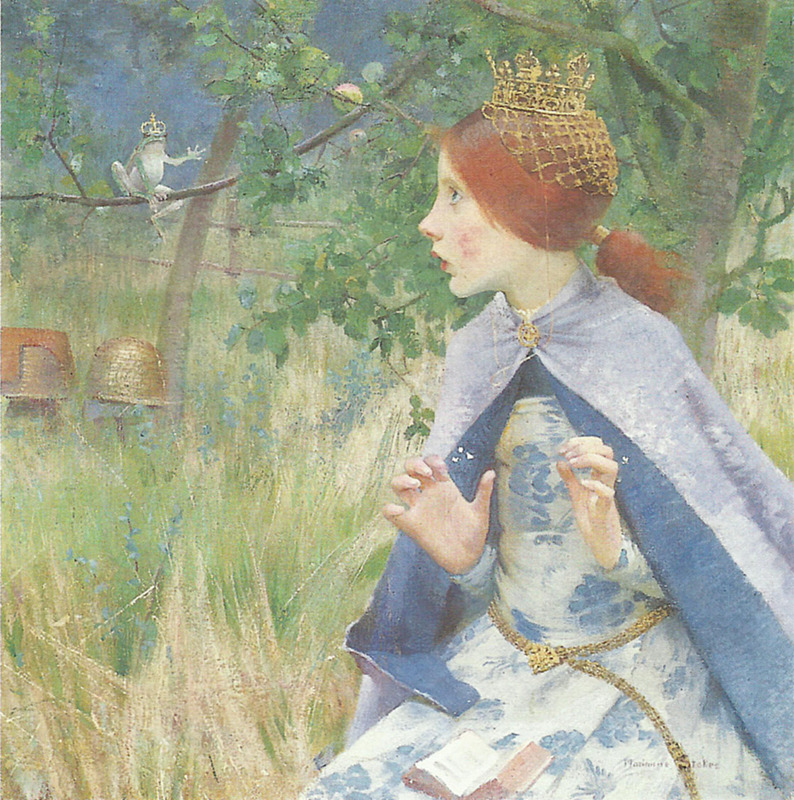 Marianne Stokes’ delightful painting of The Frog Prince from about 1890 shows an incredulous young princess listening to the talking frog, whose real identity – and the outcome of the story – is made obvious by his crown. 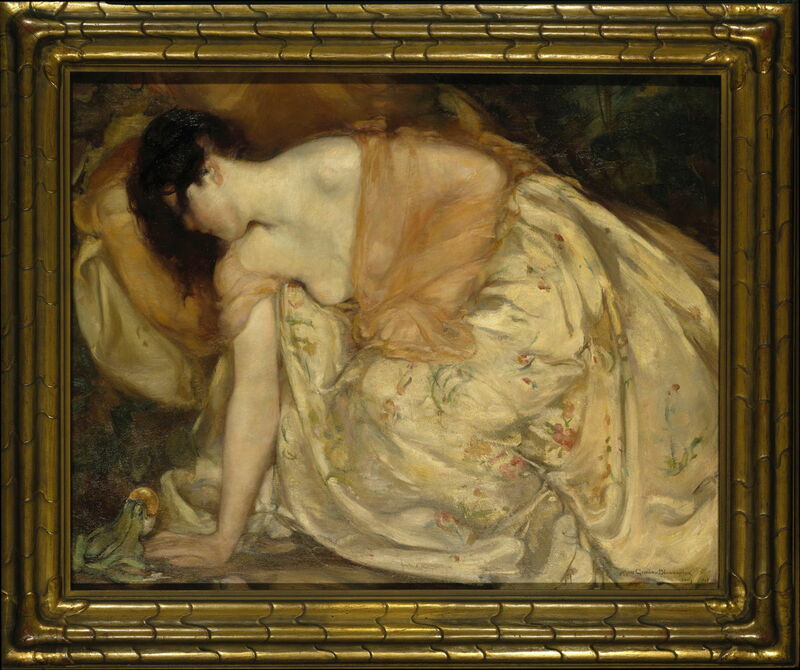 Mary Sheppard Greene (1869–1958), The Princess and the Frog (1909), oil on panel, 64.1 x 81 cm, Brooklyn Museum, New York, NY. Wikimedia Commons. Mary Sheppard Greene’s account of The Princess and the Frog from 1909 is more firmly rooted in the Grimms’ version, with the frog still holding her golden ball in its mouth, and no clue of the resolution. My final example is drawn from a mixture of folk tales, legend, and oral history, all brought together in an epic poem written by the great American writer Henry Wadsworth Longfellow (1807-1882): the Song of Hiawatha (1855). This tells of the adventures of a fictional Ojibwe warrior and his romance with a Dakota woman, Minnehaha, which inevitably ends in her death during a severe winter on the southern shore of Lake Superior. It is based on Ojibwe legends collected by American ethnographers, including those of Manabozho, although Longfellow erroneously used the name of a legendary co-founder of the Iroquois Confederacy probably from around 1450. Thomas Eakins (1844–1916), Hiawatha (c 1874), oil on canvas mounted on panel, 35.7 x 44.6 cm, Hirshhorn Museum and Sculpture Garden, Smithsonian Institution, Washington, DC. Wikimedia Commons. 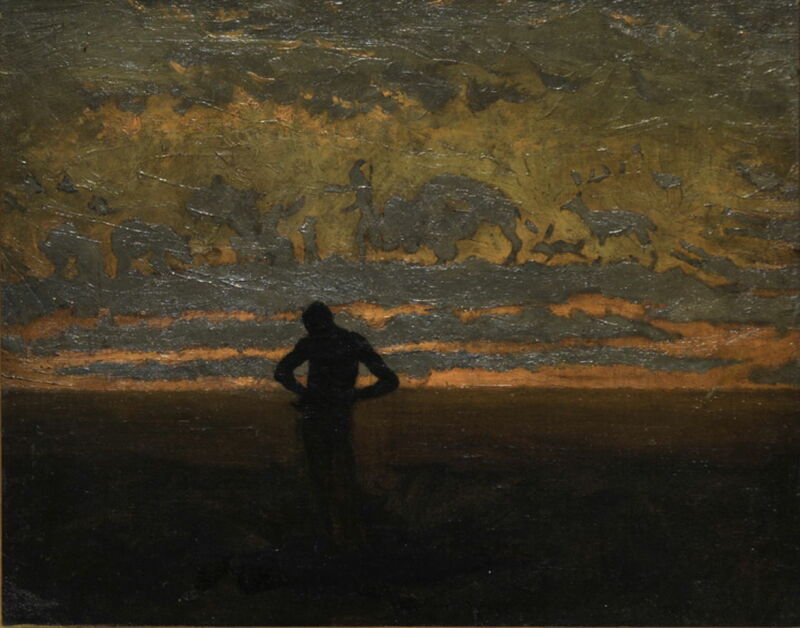 Thomas Eakins’ painting of Hiawatha from about 1874 shows him silhouetted against the dusk sky, with its clouds forming animals and human figures which make reference to the story. William de Leftwich Dodge (1867–1935), The Death of Minnehaha (1892), oil on canvas, dimensions not known, American Museum of Western Art, The Anschutz Collection, Denver, CO. Wikimedia Commons. 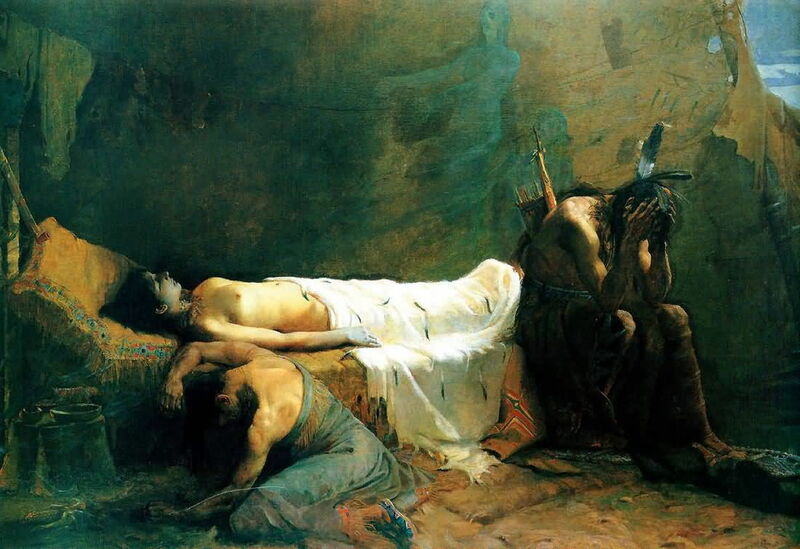 William de Leftwich Dodge adopted a more conventional approach when he painted The Death of Minnehaha in 1892. With her body laid out, the warrior sits holding his head in grief. It makes no reference, though, to the wintry context. Other paintings were even more sentimental, some bordering on the kitsch. With the progressive loss of knowledge of classical myths and secularisation of society during the nineteenth century, narrative paintings telling widely-known folk stories and their relatives became increasingly popular. Many were highly successful at the time, and are now far more readable than those of the classics. Kirsty Whiten’s Wronger Rites – contemporary stories and rituals about life. Posted in General, Life, Painting and tagged Corinth, Dodge, Eakins, Greene, Malczewski, narrative, painting, Piotrowski, Schall, Vasnetsov, Vedder. Bookmark the permalink.